Every “Hello” means a “Goodbye”! With being without internet connection for about two months I have a lot of blog material stored up in my head…only I haven’t enough time to get it down on “paper” and to upload the photos that go with it. So, for tonight I’ll emote on the departure of our good friend, Major Emmi. 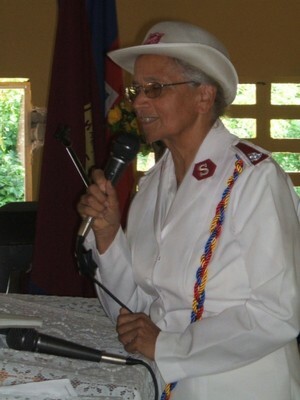 Major Emmi has been serving in FDN since 1976! She’s a nurse from Switzerland and felt the call to serve some of the world’s poorest here in Haiti. Under her leadership Bethel Clinic grew from a small first aid station to the 28 bed facility it is today. In addition to the work in the clinic, she decided early on to use her “free time” on Saturdays to focus on the needs of the children and of clean water. This use of her time resulted in planting numerous SA schools and corps and digging many wells, fitted with sturdy hand pumps. She retired in ’03 but continued to live here in the area. She has now decided that the time is right to return to Switzerland. Saturday we all went to the beach to celebrate Felix’s birthday and to get away from the clinic for some sun, sand and surf. On Sunday we went to her home in Guirand for a last Sunday together. Then we were able to go with her to PAP on Monday and spend a little time with her. She and the three lady friends that were here with her from Switzerland flew out yesterday. Emmi had been a surrogate grandmother for Matthew and a great support system for both Felix and me. She will be greatly missed. Felix spent a great amount of time interviewing her over the weekend and he plans to put together an article highlighting her experiences. She is quite an inspiration. Maybe God will use her story to call her “replacement” to the field. Its hard to believe that today is American Thanksgiving. We didn’t do anything special and didn’t even get a cha1.nce to eat our “lunch” until 6pm! I bought a live turkey last week, thinking that it would be good for today. But I’ve decided to save it for next week when my brother, Bob, is visiting from Chicago. He is the first person who has actually come to visit us! I am so excited! 1. God blessed me with Felix and Matthew. I am no longer alone. 2. A good house (apartment) to live in, with water, electricity, flush toilet, shower, stove, refrigerator…. 3. That I live in FDN (and not PAP) where it is green and not as congested. 4. That my parents are still alive and doing ok and that I get to visit them about once a year. 5. That my brother is coming down soon! Yay!!! 6. That I have internet connection again at the clinic to be able to connect with my family and friends. 7. That God has given me friends and mentors along life’s way. Thank you God for seven years with Emmi….bless her in her new setting in Switzerland. 9. That God has given us two special women who help bear our burdens in our home…Mayotte in the kitchen and Juzelle taking care of the house work. I would not be able to do my work in the clinic without them. 10. All my xanga friends who pray for me, write to me, and share their lives with me through their blogs. I miss those who have stopped writing. It sure would be nice to hear from you from time to time (Catherine, Sarah, Kelly, Jolinda, among others). Well I am sorry I haven’t written more frequently! We had an unusual Thanksgiving as well. The Mayfair (Korean) corps put on a Thanksgiving dinner for the community so we were all over there helping. It’s funny how used I am to being around people I can understand so when I am around so much Korean it still feels odd to me! However, it was a great day even though not so traditional for us. I’m glad that Bob is coming to see you – I hope that you can take off enough time to enjoy the time you have to spend together. Hi! Thanks so much for this entry. It’s so wonderful to hear what others are thankful for and reflect on what we have, what we want, and what we need. I’m thinking a lot about Major Emmi. I returned to the States this fall after 4 years in China and often feel disconnected and strange as the re-entry process continues. I can’t imagine what that would be like after 35 years! I’ll be praying for her and for you that are in Haiti, asking for more workers for the harvest. It is such a bittersweet piece of knowledge to know that Major Emmi is no longer in Guirand and near you. I am very glad she is able to return home to a group of family and friends in Switzerland, but am also fully aware that she will be greatly missed by your family and the Haitians who know her (especially those living in Guirand). Just as an addition to people being grateful for things: know that I am forever in awe and grateful that God gave me the Haitian experience, and that it’s now a place that I obviously can’t get out of my mind. 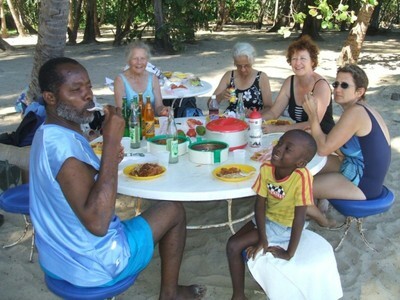 Your wonderful family made me feel that strong connection to the country by making me feel so at home in Fond-des-Negres. Mwen renmen ou e fanm ou. M’ op priye pou ou. You have so many incrediblethings to be thankful for – God has given you a very appreciative and grateful heart. 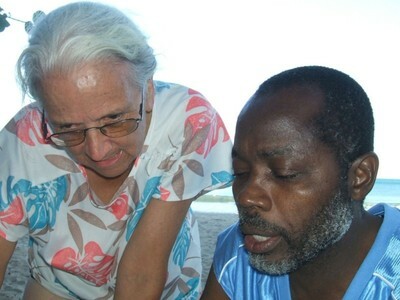 Your friend and collegue and prayer warrior Major Emmi sounds like she has invested herself in the name of Christ – what an amazing legacy she has developed through the people around her. I am praying for you and your ministry right now. I am so humbled to hear your list of thnkfuls and to hear you say how thankful you are for a flush toilet. Sorry I’ve been bad about writing. I’ve sort of defected to facebook. It is humbling to read your Thanksgiving list. It reminds me of something I saw on television last night on 20/20. They were showing families who were having serious trouble with adopted children. They said the problem is Americans adopt children from overseas (primarily Russia) and overindulge them and spoil them with material things to try to compensate for their previous struggles. It only does further damage. Any way…..it sounds like things are going well for you. We’re settled in our new home (5 months?!!) in Milwaukee and are well into the new routine. Jared is preparing to get married in January while he works his tail off in Waukegan. Erin is getting ready to start her fourth semester at Trinity. We had a very nice Thanksgiving with my brother and his family (they live here in Milwaukee) and we started decorating for Christmas yesterday. Hopefully we’ll finish today. I do continue to pray for you (although I’ve been bad about writing). God bless you, Violet. It is so nice to have you back on your page and hear whats going on. Hope that things are improving day by day following the aweful Hurricane season there. Praying for you all.